The former Secretary of State and advisor to various U.S. Presidents was referring to 1975 when – to the surprise of the U.S. – Cuba lent its support to the Angolan independence struggle. In the Cold War geopolitics of the time, the Soviets were opposed to direct involvement, while Washington blatantly supported the racist apartheid regime in South Africa. 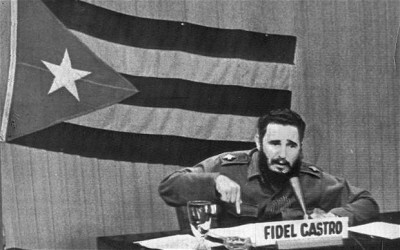 Fidel once again demonstrated that the Revolution which had triumphed on January 1, 1959 was motivated by principles and that Cuba was no one’s satellite. The heroism of those Cuban soldiers who fought in Africa and Fidel’s leadership helped to change the history of the continent and, as Nelson Mandela himself stated, end apartheid. This was the first time a small country in the western hemisphere had sent troops outside of the continent which, to the amazement of many, secured an overwhelming victory. Cuba stood as a reminder that, when motivated by ideals of justice, even a small country can fight against global powers, it was revolutionary. Cuba had already done what many thought impossible, it had carried out a socialist revolution only 90 miles from the United States. An affront for which Washington has continued to punish the island, using various methods for over half a century. “It appears there are two laws, two sets of rules and two kinds of logic, one for the U.S. and one for other countries. Perhaps it is idealistic of me, but I never accepted the universal prerogatives of the U.S.” stated Fidel to envoys of the Carter administration in 1978, who traveled to Havana setting conditions for the improvement of relations. His, a voice opposing those of the powerful, and in support of “the wretched of the world,” inevitably spread like a fine powder across the plains, jungles and mountains of the continent. The Cuban Revolution and Fidel’s ideas have inspired all those searching for a different world; looking to overcome the contradictions which world powers try to present as inevitable. Such conviction was never tied to dogmas. In the same way that Cuban weapons and resources supported guerillas fighting against dictatorships across our continent, Fidel – the fighter from the Sierra – knew how to recognize when the time for armed struggle had ended, and that of political transformation had begun. He has had the privilege of seeing various generations of Latin American revolutionaries come and go, individuals who have had the good fortune of benefiting from his support: from Salvador Allende to Hugo Chávez, to name just two of the many brave regional leaders. “To me Fidel is a father, a comrade, a master of impeccable strategy,” stated Chávez during an interview with Granma in 2005. The two leaders first met in 1994, where Fidel received the recently freed lieutenant colonel at the foot of his plane’s stairway, on arrival in Havana. Chávez’s 1999 presidential electoral victory marked the beginning of a new era for Latin America and the Caribbean which, as has been noted by protagonists of this process, from Evo Morales to Rafael Correa, would have been impossible without Fidel’s leadership. Although a counter-offensive is currently underway by right wing forces, attempting to destroy all the gains made over the last decade, there exist concrete examples of the fulfillment of over 200 years of integration efforts, such as the Community of Latin American and Caribbean States, founded in 2010. In addition to his tireless revolutionary work, Fidel’s humanist ideas have alerted many to the major problems facing humanity, from climate change to the possibility of global destruction by nuclear weapons.